Billed as an “Exclusive”, which in this case probably means a drop from the PM’s office rather than some crap they made up. And note the date – copied from Outline – this story is 4 months old, or the fight was planned 4 months ago. Daily Telecrap, so no link. Have they been outraged by the triple j Hottest 100 being held on Sunday 27 Jan this year? Following the revelation of Libs’ internal polling, Frydenberg assured the media that he was wtte “fighting every day for his local constituents”. Yet all he does in the public eye is carp about Labor. He seems obsessed with “the enemy”, mentioned Labor 23 times in one column. Maybe not the cleverest strategy? They probably will be. Another excuse to attack the ABC. I’m sick of Australia Day. It used to be a family birthday but sadly no more. The public observance is a boganfest which the political right want to own. Well, they can celebrate it whenever they want. They can take Anzac Day with it. It’s rather the opposite to the approach adopted by successful NSW Labour Premiers Neville Wran and Bob Carr. They studiously ignored their opponents to the extent that protocol and courtesy allowed. EDIT: Confessions, I thought I was up early. You’re obviously only half awake. You’ve mistaken me for Confessions. Again? Yes – half awake. Apologies. I do agree with you over Anzac/Australia Day. 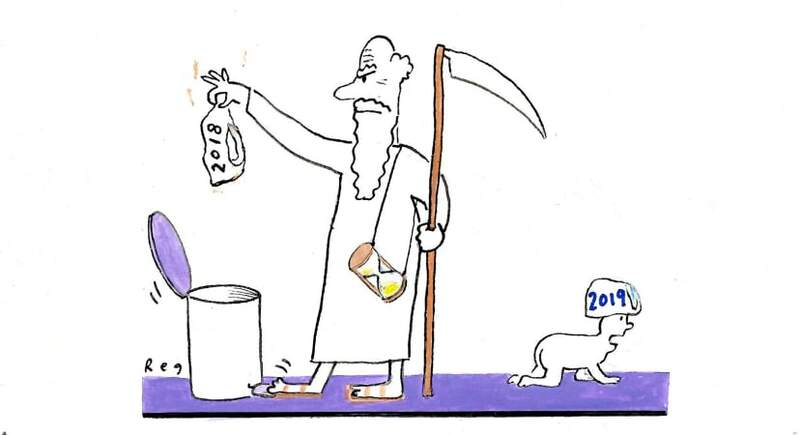 Michael Koziol has a ten point wish list for politics in 2019. Urban geographer Kate Shae tells us mot to panic – it’s the housing correction we needed to have. Shane Wright looks at our trade agreements in light of the US/China stoush. Alan Kohler writes that if there’s a recession in Australia in 2019 or 2020, or if it feels like one, the causes will be traceable back to two things that happened in 2014: the recommendation from the Senate Economics References Committee for a royal commission into financial services and the final report of Murray Inquiry. Julie Szego prepares herself for the ritualistic Australia Day patriotic venting. The managing director of a company that plans to construct Victoria’s largest windfarm says the project will supply enough power to replace up to a third of the generation of the decommissioned Hazelwood power station at less than $50/MWh. Maybe Scientology will do to itself what governments should have done. Not unexpectedly, Trump has lashed out following a New York Times report that the FBI had opened a probe in 2017 to determine if the president had been working, knowingly or unknowingly, on behalf of Russia. A good weekend column from Peter FitzSimons. The environmental catastrophe at Menindee Lakes and the Lower Darling should be a wake-up call for politicians, writes Sue Arnold. We are massive environmental crises. Crises that are so serious that, in many cases, the damage is irreparable. A long-awaited decision could settle an industrial conflict that has dragged on for several years between Home Affairs Department workers and their bosses. The Fair Work Commission has drafted a workplace determination setting conditions and pay for the department’s public servants until 2021. Chloe Booker is fed up with many companies’ customer interfaces. Has the advent of smart phones brought about a diminution of IQs? Anyone who has researched the best way to raise money for a sporting club, charity, school or community group will know that a Bunnings sausage sizzle is the most effective way to raise about $900 while having plenty of fun. Reg Lynch ushers in the new year. 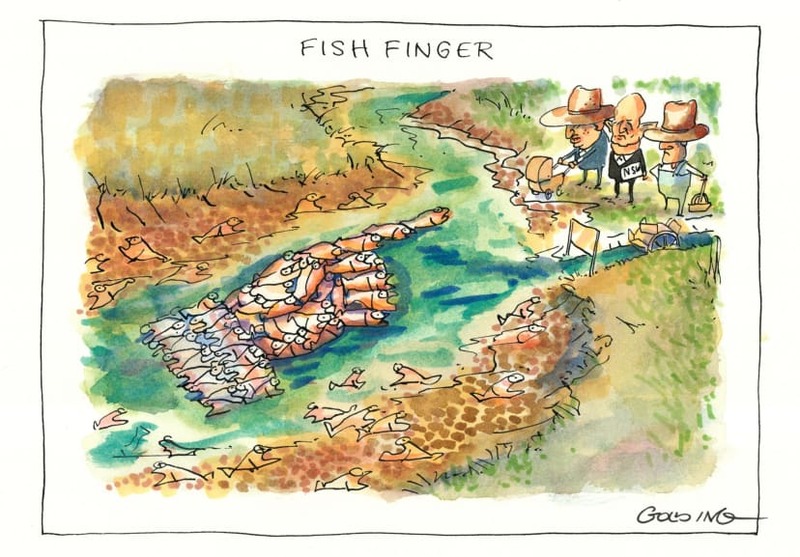 Matt Golding accurately points the fish finger. 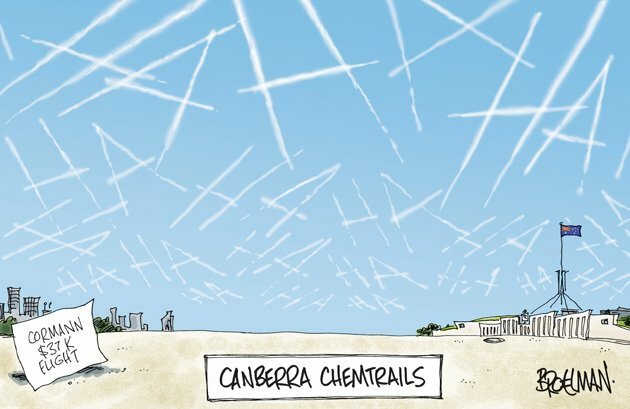 Peter Broelman ridicules Cormann’s RAAF flight. 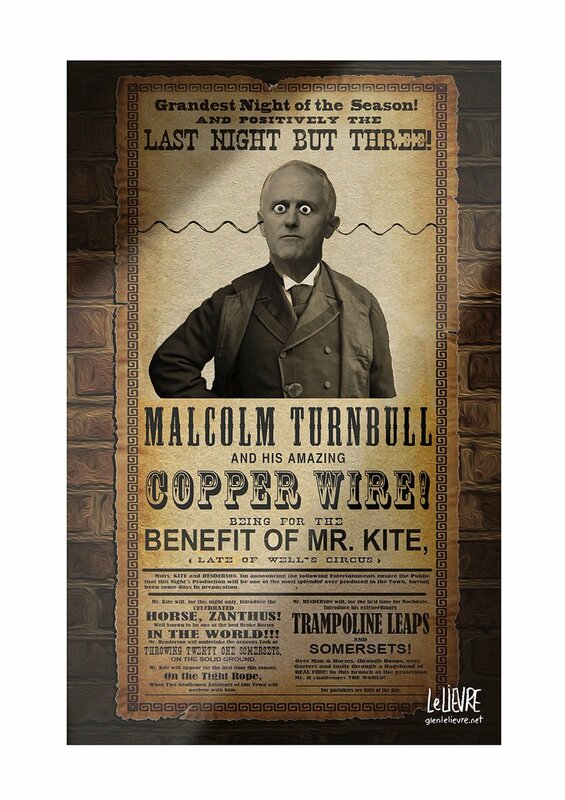 Glen Le Lievre replies to Turnbull over the NBN. Greetings from The Tweed Valley of NSW. Family Growler ensconced at Cabarita Beach and cooling our heals in anticpation of a busy 2019. Locals seem nice. We will be exploring the hinterland today. Seems like heaps to do. Blaming politicians for the failure of the MDB plan is too easy. Who is it that votes for them? The communities in the basin protested proper management of the river system, voted for its destruction, and are now trying to shift blame. Our democracy is not so broken that you could reasonably claim that our representatives are disconnected from those they represent. The voters own the outcome. I speculated yesterday that Voices for Indi holding a preselection might split the group. Of course (duh) I have since realised that there is no reason whatsoever that the unsuccessful candidates shouldn’t run, or for their supporters not to follow them if they do. Welcome to paradise, Family Growler! Um, BK are you able to put a full stop before jpg on the Reg Lynch cartoon? Thnx. The voters own the outcome. Not the lobbyists, the corporations and the rorters? In bed with those politicians the people voted for. A star Labor candidate contesting one of the state’s most marginal seats is under investigation for allegedly assaulting his female flatmate. 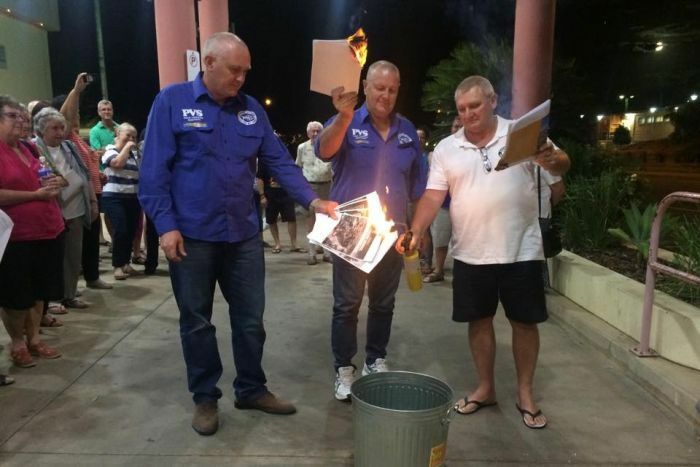 NSW Labor has directed its candidate review committee to investigate an anonymous complaint it received about the mayor of Muswellbrook, Martin Rush, who is running in the seat of Upper Hunter. I’m disappointed that JJJ didn’t move the not-as-Hottest 100 to Sat 26 Jan so they could have a proper run up to the Hottest 100 on Sun 27 Jan. Having 100-1 on Sunday, then 200-101 on Monday is traditional, I guess – but a bit odd. I’ll see if I recognise anything on the website updates. I wish the “property developer community’ would make up its mind. All those ‘foreign devils’ buying houses were they told us having sfa effect on the housing market and prices. Today……………..
“If we didn’t have the Chinese supporting our market the impact would be horrific, but I think the Chinese and Asians will continue to come to Australia and make the correction less painful than it would be,” Drapac says. There are sufficient of them that that most areas along the MDB are represented by the Liberal or National parties. As I said the other day. Nature does not give a fig about human compromises for some kind of least worst outcome that gives every human a little bit of what they want, so that we can bask in the glow of self-satisfaction that ‘something’ was achieved, that the perfect wasn’t made the enemy of the good, blah blah blah. That we humans are satisfied that we achieved some kind of deal amongst ourselves is totally irrelevant. You can’t compromise with environmental catastrophe. Mmmm, that was where the pollies struck problems as soon as they tried to ensure “no social disadvantage” (can’t remember the exact phrase). As well as the States all having a different view. But… no one admitted, back then, that water was being stolen without meters. Further to lizzie’s post of the young !!@#@! !s burning the MDB Report. It was not just ignorant young idiots. Ignorant oldie idiots were in to it as well. The Nats told farmers what they wanted to hear – that there was plenty of water, but those nasty greenie types (both Labor & the Greens) were either letting it run down the river and uselessly out to sea because they were opposed to building dams, or they were using it to water useless stretches of forest. Either way, good honest farmers were being ripped off. They told farmers what they wanted to hear about climate change – not to worry, drought’s part of the natural cycle. This has encouraged farmers to persevere in bad times, borrow more money than they might have done otherwise, and stick it out in situations where they should just have cut their losses. Of course, when slightly better times come, the farmer has a sh*tload of debt which can only be repaid by extracting every possible cent out of the land. You are being obtuse. You have crossed enough borders to know the principle of visitor visas. That is the reality. Did you actually read what your link says. So, in 2017-18 more than 20,000 of a total 27,931 asylum seeker claims came from 3 Countries that have a very low rate of legitimate claims, he mentions about 2%. He talks about this being part of a rort where people are brought over on visitor visas, they then claim asylum and are moved to a bridging visa which allows them to work. appeal the negative protection visa decisions at the AAT so overall time in Australia is extended to possibly more than 2-3 years. This has nothing to do with the two cases we have been discussing and you are conflating the issue by trying to include it. So that seems to leave less than 6,000 people who travelled by plane to Australia on a valid visa who subsequently claimed asylum with some merit to that claim. I certainly don’t see those numbers as being much of a problem in the scheme of things. Certainly the rort outlined above is a concern that needs to be dealt with and he goes through some ways that the Government and Immigration may be able to attack it. The “Outrageometer” will be dialed up to 11 on Sunday Jan 27th by the Murdoch media and their subsidiary parties, the Liberals and Nationals, for TripleJ’s hottest 100! And I expect Morrison to call the election around that time, red in the face with outrage. One of the worst mistakes this country has made was to shift the Australia Day holiday back to 26 January, rather than having it on the nearest Monday, as used to be the case. In those bygone days, everyone knew what was being celebrated: having a long weekend. And who knows how many sickies are now taken if the holiday falls on a Tuesday, Wednesday or Thursday? One of the worst mistakes this country has made was to think to the date the NSW colony was established has any real relevance outside NSW. Reclaim the Leafy Upper North Shore! Drive out these White Turramurra gangs! Lock up the Berowra Boys! It’s not safe to go out in the streets to enjoy Oz Fuzion sushi cuisine with a drizzle of wasabe sauce anymore! Knox College students need a chauffeur, just to get to their early maths coaching classes! Where is Dutton when you need him, and why aren’t questions being asked of Bill Shorten? Dotard has been busy howling at the moon..
His reasons for firing people are often thought to be bad ones! An entire country called Australia, that at every conceivable instance to have a celebration, to observe and mark an occasion, will require its inhabitants to consume unedifying quantities of alcohol and food as a measure of the events significance. Governments at all levels will authorise the spending of ever increasing amounts of public money to achieve the required level of inebriation and gluttony to prove their level of ownership of these events. As each year comes and goes the words to the song that includes in its lyrics “we are one we are many” has come to represent competing individuals, communities and groups to interpret and display “we are the better ones and we know how to party better than you cos we’re true blue”. Australia has become a country represented by utterly loathed politicians unable to decide upon and agree upon leadership within their own organizations. These governing mobs than maintain a “what’s in it for me” covenant as the defining measurement of decision making. The more the politicians talk about the oneness of Australia, the decision making achieves the opposite. The Darling river is empty, the GBR is disappearing to become just a barrier, feral animals own the entire nation, Melbourne desperately wants to overtake Sydney as the the most congested and unlovable city on a very dry continent and we lock people up on remote islands. I’m sure a well known leader once said that we will decide who comes to Australia and who gets to destroy the nation. A PM wanting to display their significance and the ownership of the country by determining that citizenship ceremonies and events are to be held simultaneously is seriously misreading public sentiment. We are festooned in swathes of a very unnatural blue flags containing a group of stars most of the population couldn’t identifying within the Milky Way and somebody elses flag stuck in top left corner. Bougainvillea should become the national flower as it doesn’t come from Australia like the majority of people, politicians, animals and plants now dominating our nation. People in Homebush have been given loans by dodgy banks to purchase dodgy apartments so they can struggle to get to their casual part time work upon leaving their kids in government subsidised childcare organizations owned by dodgy politicians. It’s perfectly reasonable that the entire nation becomes inhabited by mobs of drunken yobbos to celebrate our successes. Yes, it’s like hearing Frydenberg and Morrison saying a year ago that negative gearing definitely did not contribute to higher house prices. Fast forward one year – apparently now any changes by Labor to restrict negative gearing will (according to Frydenberg and Morrsion) will cause prices to crash! I remember the one (and only) Hottest 100 I have ever had the misfortune to be exposed to. It was in 2015, Australia Day. We were camping up the Glorious NSW Mid-North Coast. The traditional bogan invasion was in full swing for the Big Day. They had their little plastic Aussie flags wedged into their tradie’s ute windows. They had their woofers ramped up to peak thunder, able to crumble besser bricks in minutes. They had carloads of canned beer and Jack Daniels with cola. They swore. They shouted. They screamed. They giggled. They stayed up all night carousing, bonking and totally ignoring the music (oh that I could have!). They were indistinguishable from morons. And that was just the females. It could have been worse. It could have been a Sunday. Then we’d have had Macca droning on all morning. Then we’d have had Macca droning on all morning. That would have been the seventh circle of Hades! BK linked the Scientology article, which contains this dubious contract clause for the Taiwanese adherents coming here. I’d like to see one of them sued for specific performance..
“Meanwhile, defectors claim the Church’s solution to its dwindling standing in Australia is to bring in believers from Taiwan, where the religion has flourished in the last twenty years. “They come out here totally devoted to doing as much Scientology as they can, on as little amount of money, before going back to Taiwan,” Mr Schofield said. The chap filling in for Macca this morning seems to have only one topic of conversation: the music of Paul Kelly. What IS it with the ABC and Paul Kelly? For that matter, what is it with Paul Kelly, period? Barney, no. You hadda be there. Remind me why Jhye Richardson isn’t in the CA XI team for the Sri Lankan warm up game and contesting for a test call up? Yes, it’s like hearing Frydenberg and Morrison saying a year ago that negative gearing definitely did not cause higher house prices. “Yet the government, and the property industry, persist with the fiction that the temporary abolition of negative gearing for property investors by the Hawke government between 1985 and 1987 resulted in ‘rents going through the roof’, and that this ‘history’ would be repeated in the event that negative gearing were to be abolished – or even ‘tinkered with’ – again. Eslake said Treasury also advised the government that Labor’s policies “could introduce some downward pressure on property prices in the short term”, particularly if those proposals were to come into effect coincidentally “with a weaker housing market” but that “in the long term” any such downward impact would be “relatively modest”. He said Treasury went on to note that the extent of any impact on property prices would be likely to be limited by the response of owner-occupiers. What is it about negative gearing and its ability to make conservative governments espouse absurdities and to ignore advice? This week came the news that before the 2016 election, Malcolm Turnbull and Scott Morrison were making claims about the impact of the Labor party’s negative gearing policy that directly contradicted advice from the Treasury. This was followed on Thursday by Fairfax revealing that the New South Wales government had ignored the advice of its own treasury department that negative gearing was pushing up house prices. Negative gearing is the economic equivalent of a migrant crime story – something conservative political parties believe they can use to scare voters despite little or no relation to facts. I am surprised at the polling that shows only Dan Tehan and Tim Wilson would retain their seats at the next election. So will Dutton make his leadership push this week? Reposting what I posted on November 9th last year – seems even more relevant now! Working out along the Darling River ‘catchment’ – ie half of NSW! Mr Lamey joined the battle after the property next to his bulldozed the land and dug channels to divert water from 30km of floodplain into its dams. It also built a bridge over the river on Crown land. In 2016, when a modest flood arrived, all the illegal work caused his farm to become flooded and he lost a $1.4 million crop of chick peas..
And today Owen Whyman, a Barkindji man from Wilcannia, has declared as an independent candidate for the NSW seat of Barwon, to fight on the issue of water for the Darling River and the Menindee Lakes System. A station owner near Wilcannia told me that Lake Menindee is totally dry, Lake Tandou which has been dry for years but used for cropping and pasture is “stuffed”, and the Government now wants to substantially reduce the water in Lake Cawndilla (the deepest lake in the system). He said the Darling between Bourke and Wilcannia has been reduced to a series of waterholes, and he thinks the lower Anabranch is totally dry. As a result of the Government Menindee Lakes “Plan” the amount of agriculture in the area has fallen dramatically, and with it the number of employees and seasonal pickers resulting in further economic damage to an already disadvantaged region. At public hearings in Adelaide last week for the Royal Commission onto the Murray-Darling Basin Authority, Richrad Beasley, counsel assisting the Commisioner, was damning in his assessments. “The Basin Plan was a fraud from the start because it ignored the advice from the CSIRO that almost 5000 gigalitres had to be returned to the environment. Instead, CSIRO scientists told the commission they were ordered to make the figure “start with a 2″ or they would not be paid. This is not a careless error or a misinterpretation of the Water Act. It involves the knowing or reckless disobedience of the law in implementing the plan, which itself involves expenditure of billions of dollars of public funds. His basic conclusion was that the Menindee Lakes Project was illegal, as it contravened elements of statute law in the Water Act. In the 2015 election for Barwon which covers most of the NSW catchment of the Darling River, the primaries were – Nat 49%, Labor 24%, Ind 17%, Green 6%. TPP – Nat 63% v Labor 37%. If this new Independent could get ahead of Labor, and if the National vote falls below 45 which I think it will, the Coalition could lose another safe seat. ICFTLOM (I can’t for the life of me) understand why citizenship ceremonies must be on just one day of the year – why not once a quarter or any other option or at the discretion of each council?